A few weeks in a fever not only Fortnite , but also the surrounding reality. Missing from the game hamburger with sticking out tongue showed up in the California desert, famous llamas were found in London, Warsaw, Barcelona. In the game itself, ancient anchors, stagecoaches of the Wild West and other artifacts began to emerge from nowhere. And the company Epic Games threw images of strange masks and ancient axes . Part of the incidents have already received an explanation and justification. In Fortnite started the next, fifth, the season. And it passes under the sign of a collision of worlds. Ancient statues, pioneer outposts, Viking ships and flint pistols appear on maps and in the arsenal of players. From time to time, the heroes will meet mysterious faults, beyond which they are waiting for unexplored locations and new tests. During the new season in the cooperative mode “Battle with the storm” the event “Trip” began. In it you can fight with the horde, arm yourself with ancient weapons and discover the heroes of the Wild West. 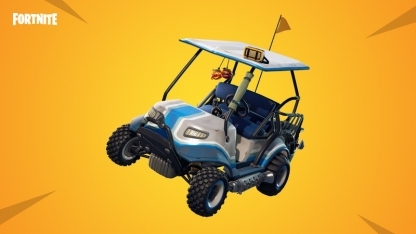 Fans of Fortnite Battle Royale will be able to ride an all-terrain vehicle. And the modified system of narrowing the safe area will make them look more closely at their location. More information about all the innovations and changes can be found on the official site of Fortnite.